Today marks 100 days since Obama signed the bill finally repealing Don’t Ask Don’t Tell. And yet, the policy is still in place. The White House and Pentagon have not certified repeal, and the tentative timetable put in place by the military has yet to be rolled out. In the meantime, while the politicians politic, gay servicemembers are dying in the closet. They are dying in silence, unable to be their true selves and still living in fear of being punished or discharged for who they are. No one should have to deny their being, especially not those who are fighting and protecting their fellow comrades. The story of Cpl. 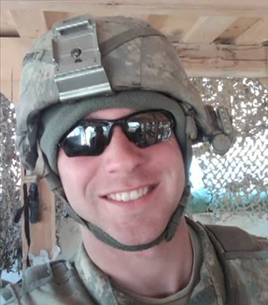 Andrew Wilfahrt, a gay servicemember who recently died, has really touched us. This man was selfless, and died while shielding his colleagues from danger. He died before DADT was repealed, and never had the chance to be the out and proud gay man that his father remembers in this video. Watch the video, and then join the Courage Campaign in sending condolences to the Wilfahrt family, and urging Congress to speed up DADT repeal.